What makes our route exchange unique? It increases the number of fixed trucks you might have working for your customers and it also optimises the less profitable routes. Why use our route exchange? Get to know companies that will give you steady work. 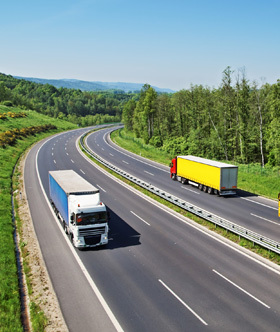 Make money from your regular routes without having to look for freight every day. Get agreed stable prices and routes for a definite period, and forget about the ups and downs of the market. Negotiate prices by campaigns or longer periods and avoid negotiating prices day by day. Find hauliers who define themselves as efficient specialists for particular routes. Our online exchange is in permanent contact with the market and is always up to date with new hauliers bidding for all the routes. Secure and solvent companies in Europe to deal with. Would you rather work with known hauliers and extend the ones you already have? Do you need a quick and efficient system of approved hauliers?